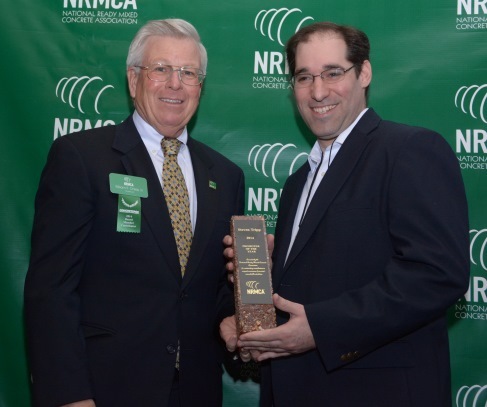 The National Ready Mix Concrete Association recognized Steven Tripp as its 2014 Promoter of the Year. Steve arrived at Chaney Enterprises from banking industry in 2007 and so is a relative newcomer by the standards of our industry—which makes it all the more impressive that he has gained expert-level knowledge and status among his peers and customers. One very active area of promotion development for Steve has been through a continuing education program known as Chaney University. Many seminars, webinars and demonstrations have been developed by Steve to introduce new concrete products. Topics include Pervious Concrete, concrete fundamentals, concrete overlays and concrete roads. Since 2009, almost 1400 specifiers have participated in this program, resulting in numerous concrete projects primarily in pervious parking lots. Steve’s industry participation has also been extensive, participating and holding member positions with NRMCA, Maryland RMCA, Virginia RMCA, NSSGA, ACPA and USGBC. One measure of Steve’s high-energy level is that he has received the MRMCA award for outstanding promoter three times. NRMCA pervious certification classes—Steve has offered more than anyone else in the region. A Pervious Concrete online database and map for Maryland. An online Concrete Paving Assistance program for apples-to-apples comparison of concrete and asphalt paving. A new easy to navigate Chaney Enterprises website that optimizes product searches. A Smartphone app with 160,000 installs and rave reviews. Steve was also at the center of a promotion milestone in the region, the Benfield Blvd. overlay demonstration. After meeting with the Maryland DOT, speed of construction was identified as the main resistance to concrete. Steve collaborated with MRMCA and local ACPA staff and members to orchestrate a fast-overlay demonstration for the state. As a result, Maryland now has a DOT approved, rapid-cure concrete mix for paving and repairs under strict traffic restrictions. Follow-up promotion, through a video documentary produced by Steve, has led directly to two recent projects being converted to concrete. As a result of Steve’s efforts, three Maryland counties have agreed to change their default specs to include reasonable concrete design, and the state has adopted Steve’s recommendation to offer a residential road standard for the counties to adopt. To further increase the pace of street and local road concrete opportunities, Steve has been leading the charge for LCCA legislation in Maryland. He organized the industry and authored many parts of the legislation and testimony. The legislation passed in the Maryland House of Delegates 128 to 9. For concrete parking lots, Steve’s approach has been to not just work with owners, developers and specifiers, but also to work with contractors, with good success. He has also begun roller compacted concrete (RCC) market development in Maryland. After identifying an asphalt contractor and engineering partners, experiments have begun to launch small RCC jobs. Through his efforts on behalf of his company and our industry, Steve is a true champion of ready mixed concrete. With imagination and enthusiasm, he has shared with his peers a fresh and exciting perspective on promotion, resulting in customers and specifiers that recognize enormous new possibilities for the modern version of our age-old product.